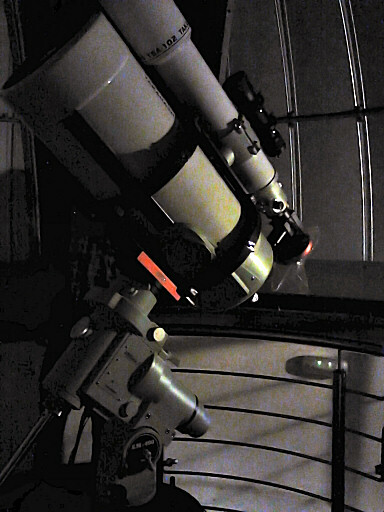 Tonight I’ve enjoyed observing a visual of Jupiter through a Mewlon 250. Although there was turbulence, it was worth. I had never seen a Jupiter so detailed by telescope. I could depict up to four bands, the great red spot and both polar icecaps. Inside bands I could see small details as well. Also it has showed up Jupiter’s satellite Europa at its limbo during the observation. I’ve got the best visual results without barlow, only using a 15 mm (200x magnification) eyepiece. When using a barlow 2x, obtaining 400x magnification, details were not so easy to detect. The telescope is a reflector Takahashi Dall-Kirkham at f/12, yielding 3 meters of focal. I have also realized that when sit down in a chair and keeping the vision of the planet during several minutes trying different focus, the eye eventually adapts to the brightness of the planet and increasingly captures more details. This entry was posted on 2013/02/09 at 12:27 am and is filed under Astrophotography with tags 10 inches, Jupiter, Mewlon, observation, takahashi, Telescope, visual. You can follow any responses to this entry through the RSS 2.0 feed. You can leave a response, or trackback from your own site.